The twisty, gripping number one bestseller from Richard and Judy Book Club winner Clare Mackintosh, author of I Let You Go. If you like Shari Lapena, Paula Hawkins, Rachel Abbott, B A Paris, Fiona Barton, Ruth Ware and CL Taylor, you'll love this gripping psychological thriller. Clare's debut novel, I Let You Go, is a Sunday Times bestseller, has been translated into thirty languages and was the fastest-selling title by a new crime writer in 2015, selling over one million copies worldwide. It was selected for both the Richard and Judy Book Club, where it was the winning title of the readers' vote for the summer 2015 selection, and ITV's Loose Women's Loose Books. I Let You Go also won the Theakston Old Peculier Crime Novel of the Year in 2016. 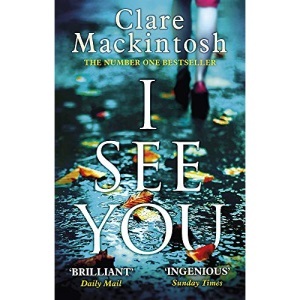 I See You is Clare's second novel, a number one bestseller that was recently voted the winning title of the Richard and Judy Book Club summer 2017 selection. Clare is the patron of the Silver Star Society, an Oxford-based charity which supports the work carried out in the John Radcliffe Hospital's Silver Star unit, providing special care for mothers with medical complications during pregnancy.